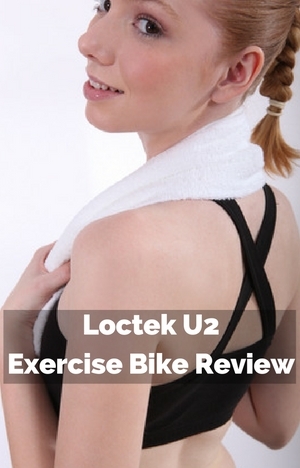 The Loctek U2 Exercise Bike is an interesting design. There aren’t many others that have come up with this idea for combining exercise and work. It does make it look unusual but it is innovative! It does look like it is missing something and it is – the front post, handlebars and console. But this is something people ask of the standard design upright exercise bikes as to whether they can be removed so it can fit under a desk so they can use it while they work. Loctek U2 has done this for them! It is one of things we are told that we spend too much time being sedentary at work or play and in between we’re sat in a car driving between. This bike looks to help with that by adding the opportunity to exercise while you work. In my review I’ll look at how this bike help to combine exercise with work and/or play to improve fitness and help achieve your goals and save you time too. The bike has a steel frame, stabilizer bars and seat post which hold everything together so that you have a stable and sturdy platform as you exercise and work. The bike won’t be creaking or moving around causing a distraction from exercise and work. You do need to hold yourself steady on the seat as there are no handlebars but it does have a good size seat with a backrest which makes that easier and if using with a desk you’ve got that to help you if you need it. If the floor you are putting the bike on is a little uneven it is possible to turn the back stabilizer end caps to balance up the bike. It will only work for those floors with a small variation. There isn’t any feedback from customers in their reviews as to how durable the bike is because it hasn’t been around that long but they do say it is well built so there is the expectation that it will last. The bike seat horizontal and vertical adjustment allow you to fit the bike properly for your height and leg length. It is best for people between 5ft 1 ins and 6 ft 0 ins. The height of the seat can be changed up to 8 inches and the horizontal position by 4 ins. It all helps to get the proper position for your leg length and comfort. Making the adjustment is quick and easy to do, so it can be used by more than one person. The adjustments do need to be done off the seat. Both the horizontal and vertical adjustments use an adjustment knob that you loosen and then slide the seat to where you want the seat to be. The vertical position does have pre-set positions as the knob has a pop-pin that you insert into a hole in pole to hold it in place. With the horizontal position you can put the seat where you want. If there is more than one of you using the bike you may want to mark on the pole and slider the positions you want to adjust the bike with a permanent marker. It makes it quicker and easier. If you are shorter than the minimum height you probably need to stretch to reach the pedals at the furthest position unless you have long legs, If you are over the maximum height it is more likely that you’ll feel cramped and won’t be able to get the full range of motion for your legs which can cause pain or injury. It has 8 levels of magnetic resistance that is controlled manually by a knob at the front of the bike. The levels aren’t marked on the knob so it can be a little difficult to return to a previous level as you need to remember the positioning etc. The movement between the levels is smooth so there isn’t any sudden lurches up or down in the amount of resistance you are pushing against. It goes from very little resistance to moderately hard in increments. It’s not going to give you steep hill type resistance which is probably not what you want any way if you are working at the same time. Most people find that the resistance level 3 – 6 are enough to give them a reasonable amount of exercise and if they push themselves they can get their heart rate up and get a sweat on. And you probably won’t be wanting to be pushing yourself to the limit while you work or play as it is as much about getting the benefits of more activity while still completing your other commitments. The tension knob at the front of the bike is low down so you’ll need to bend down a bit to reach it when you want to change the resistance. As long as your balance is good you won’t have a problem or you can use a desk for support. It is low maintenance and very quiet. The bike has a belt and flywheel to provide a smooth and quiet pedaling motion. It provides a good consistent motion although it may start to feel a little sticky at the top level resistance as the resistance starts to work more as a brake slowing the pedals as you move around the top/bottom of the pedaling motion. It operates very quietly and is low maintenance too – there isn’t adjustments or lubricating as you get with a chain drive. It is all enclosed which keeps all these moving parts away from children and pets. It also helps to stop sweat and dust causing issues. It has a 1 piece crank that should provide a reasonable strength and durability for the type of exercising you are likely to do while you work or play at a desk or reading a book. The pedals themselves have an adjustable plastic strap to keep your foot in place and stop it sliding off. The tab that holds the strap in place is fairly solid so they won’t be coming off mid pedal. They’ll fit over larger shoes too. It can be tough to adjust the straps as getting the tab through the holes in strap takes some effort. If you are the only person using the bike then you only have to do it the once and then you can slide your foot in subsequently. The pedals are best used with athletic or similar shoes. Seat. It has a large padded seat that is contoured to provide more comfort on the sit bones. There is also a padded backrest to provide more support. The large seat and backrest help with balance so you don’t feel unstable like you might on a stool. If you are new to a bike seat you may still find the seat uncomfortable in particular at first. That just the way bike seats are. There isn’t a one size fits all. If the seat is still too hard to sit on for the period of time you want you can try a gel seat cover and this works for a lot of people. And if that doesn’t work or you’ve got a bike seat you like it is possible to replace this one with any standard fitting bike seat. If it is a little numbness it might serve as a reminder that it is a good idea to take a break from sitting and the computer to give the legs and rest of the body a stretch. The backrest does help with balance and makes it easier to sit there and pedal without the handlebars. You can read a book or use an iPad as you pedal if you want. It would’ve been great if there’d been handlebars at the side for some more safety. For some people the backrest may seem a little close and that it means you can’t sit on the seat properly when leaning back against it.It does have a slight tilt backwards which helps. It is fixed in place in relation to the seat – it moves backwards and forwards with the seat. Handlebars. The bike doesn’t come with any handlebars so it can fit under a desk. This does mean you need to able to get on the seat without this support or maybe using the back of the seat or maybe using your desk for that. Cleaning. It’s not going to increase your cleaning routine much. It’s just important to keep it clean of sweat to reduce the corrosive effects of this. You may want to put it on a rubber exercise mat if you want to keep the floor from sweat. Noise. The bike operates very quietly. If you use it in an office it won’t disturb your co-workers. Also, if you are on the phone no-one will know you are exercising from the bike only if you’re breathing hard. If you want to use it while the TV on it is easy enough to do without turning up the volume. You can also use it at night as you probably won’t disturb anyone sleeping. The quietness of operation along with its’ compact size can make it a good idea for an apartment. The loudest noise from the bike is a soft clicking sound from the tension knob when you change the resistance level. Other than that there may be some noise from the person using the bike which could be heavy breathing when they exert themselves. This is a compact bike that can fit in a closet if you don’t want to leave out. It needs an area of 18 by 27 ins. With it weighing 45 lbs it’s not too hard to move. The size means that you may be able to leave the bike out when you’re not using it as it isn’t going to take up much room and leave it next to the desk as you would a chair. To help with moving the bike the front end caps also work as wheels. To use them you need to tip the bike forward on to them allowing them to move freely. You may find they stick a bit in some cases, in particular on carpet and you may end up sliding. At 45 lbs you may find you can lift it if you don’t have far to move it although it would be better if there are two of you. The bike is delivered part completed. It normally takes around 1 to 2 hours to finish but it can be done quicker. Everything needed for the assembly come with the bike including the tools. The tools are good enough to get the job done but if you have your own wrench and screwdriver you can probably get it done quicker and more easily.. There is no real sticking points with the assembly. There aren’t any cables to attach and the hardest part of the assembly has already been done for you (the drive assembly). You are required to add the stabilizer bars, pedals, seat post, back rest and seat following the instructions. So not too much needed to be done. The instructions and diagrams are clear. If you are still unsure it is possible to have this assembled using a service through Amazon which has good feedback from customers. It does cost extra and is done in your home. As with the handlebars the bike doesn’t come with a console to help you know how well you are doing or to help you track your performance. Not everyone is interested in this information so it may not be that big a deal unless you like your numbers. The bike doesn’t come with any accessories, there isn’t the room for them I guess. That is the big thing about the bike really. What is doesn’t have, which makes it more useable by some people who want to use a desk while they exercise. There isn’t the front post, console or handlebars to get in the way of using a desk. The desk height does need to be at least 39 inches high to be able to reach a laptop or keyboard comfortably and be able to get your knees under it. This is higher than a standard desk or table by about a foot. Depending on how close you like to be to the desk you can add a stand to increase the height of the laptop or computer to make it easier to work with. You do need to be sure you watch out your knees aren’t hitting the desk and probably need to turn it at an angle to do this which probably isn’t good for the back long term. You may want to use it with an adjustable desk or table to get the best height and avoid any knee banging. Some use it with a standing desk so you can get the best of sitting and standing at work. Using a desk rather than having a bike that includes a desktop probably means you get much more room and you’re not necessarily stuck with a laptop as you can probably use a desktop if you prefer. Everything is probably going to feel more secure too. Although there aren’t a huge number of reviews for the bike they are on the whole positive, with one exception where someone seems to have had bad luck with the bike that they had delivered. One or two don’t like the seat but on the whole they find it comfortable enough for sitting on to work and exercise for good periods of time. People in their reviews do mention it would be nice to have a console (it’s something I’d like) but they don’t see it as too much of an issue. They like how sturdy and quiet it is. The people who have had it for a short while find it steady enough to be productive at their work or for enjoying their entertainment and they get a good level of exercise to help with their fitness. There really isn’t a direct comparison with this bike. The closest being exercise bikes with a desk. It is comparable with the lowest price one of those, and this is a folding exercise bike. It does have the advantage that you can have a bigger desk to work on. Although the bikes with desktops are stable the Loctek U2 is likely to feel more sturdy as your exercise and work or play on a desk. When I checked on Amazon eligible orders qualified for Prime and free shipping. There are a few compromises with the bike so you can use it with a desk. There isn’t a console or handlebars and you need a desk at least 39 inches (or need to put laptop on a stand) to be able to work. An adjustable table or desktop (standing desk) is probably the best option if you are wanting to use it for work for extended periods. The lack of console does mean you won’t have any indication of how much exercise you’ve done – you’ll have to use time as your goal – it does also make it a little harder to stay on track. You may be able to do this with a fitness tracker (as one review suggests). It does provide a good stable base for exercise while you work. It’s quiet and you can just get on with your work while you also work on your fitness The pedaling motion itself is quiet and smooth so you can have phone conversations and not disturb others if using in an office or anywhere.